Spring is in the air. Now that we are back to daylight savings time and our evenings are light longer it's time to get excited about spring. Trees are budding all over the place and flowers are in bloom, things are coming back to life, Yipeeee. If you are thinking about painting something for the spring season how about painting something for the yard or your porch to welcome friends and family when they show up. 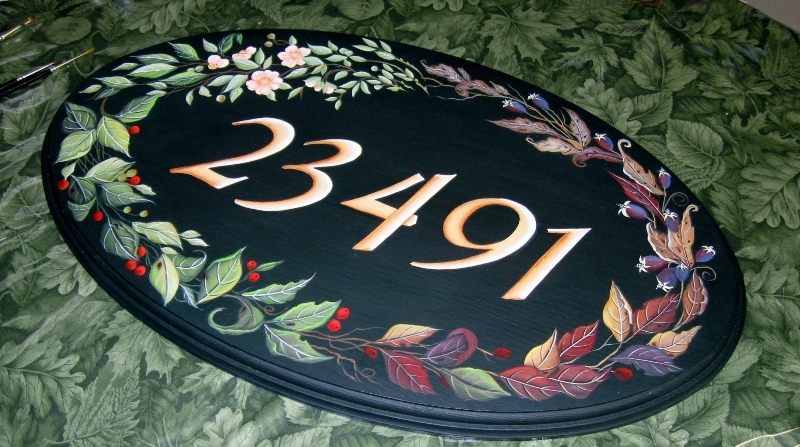 I'm painting a new house number sign for my yard. Here it is in the works, it's a leaf design that will go from spring , summer, fall and winter. You can find this design in a series of last years Paint Works magazines. I'll post this again when it's finished. 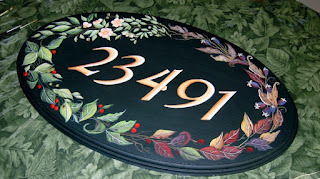 Everyone should have their house numbers displayed it's important to have them displayed clearly visible from the street. 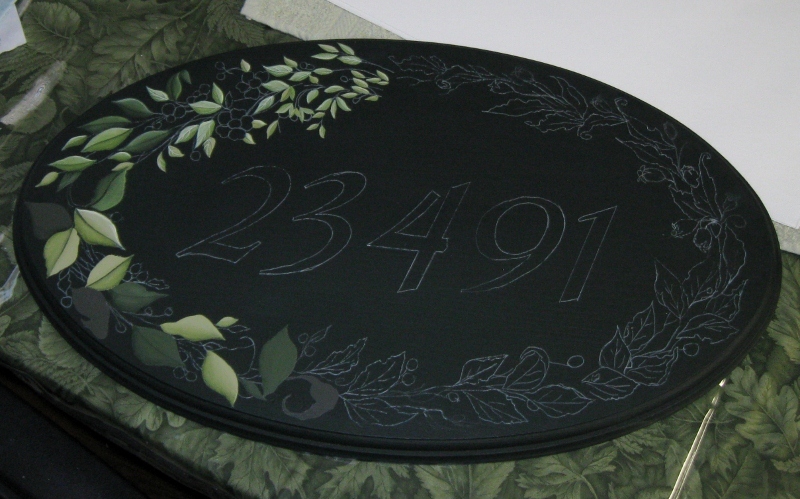 Numbers placed where they are easily spotted by fire, police and ambulance personnel may save lives. My advise if your painting anything to put outside is to make sure you seal the wood with a few good coats of sealer before you start painting your design. Then once you have finished the design the most important part is sealing the piece again with several coats of a good weather proof varnish. When buying varnish look for one that doesn't yellow, that's very important, the last thing you want is to have all your work turn yellow with time. It's not that easy to find in the stores, at least not in my area. I use J.W.etc. Right Step water base Clear Varnish. This one I have painted the monogram and I used vinyl for The Marshall Family. If you would like to have a sign for your yard you can contact me here or through my web site www.joycespaintnplace.weebly.com just leave a message in the comment box there. Until next time happy painting.